It has been one and a half year since I have taken my first step in the journey towards finance freedom. 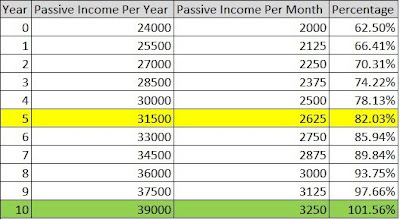 And finally I have reached another milestone as my passive income has amounted to $2000 this month. 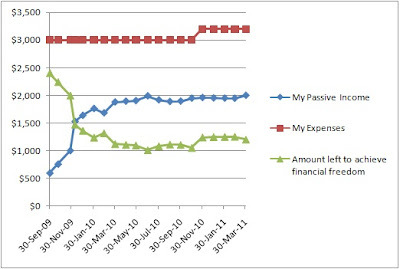 I have done a projection on the growth of my passive income as shown below. This is based on the assumption that I continue to invest $30k per year on shares that give me a dividend of 5%. The projection is quite in line with my next 20 years goal. 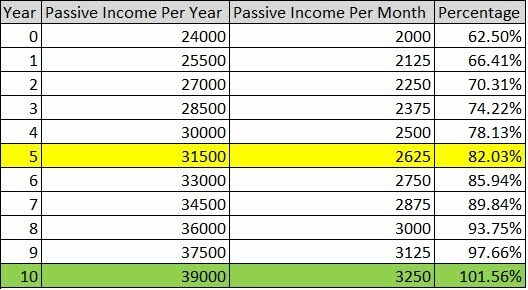 If nothing goes wrong in the next 5 years, I should be able to achieve a passive income that covers 80% of my expenses. And next 10 years, a passive income that covers 100% of my expenses. Monetise our property for free cash flow. room rental is cool. but need to have room for rental which i do not have. i am happy for you that you are closer to your target. All the best!